#Packers S Kentrell Brice's return to the game is questionable because of a shoulder injury. Big-time broken assignment there. You can bet the Falcons dialed that up from something they saw all week. Joe Thomas should not have rushed. That was his guy all the way. Maybe just a simple blown assignment. #Packers S Kentrell Brice has a shoulder injury, return is questionable. Peppers and Clark stuff that run. Very nice stop setting up third and goal at the 2. Nice Favre-like play by Ryan. Hyde lost track of Sanu and played Ryan for the run. Easy flp for the TD, but there is a flag down. HHCD gets called for unneccessary roughness, which will be marched off on the kickoff. Ryan to Sanu for a 2-yd reception. Third downs are so important today. #Packers D must get off the field. Falcons converted all 3 on their opening drive, taking a 7-0 lead. Worst possible start for the Packers. Long drive, no pressure on Ryan. Easy touchdown. It's on Rodgers and the offense now. That's a good question. I've seen Sherman do that all the time. But there must be a differece. Impressive start for the Falcons. Ryan with a backhanded flip to Mohamed Sanu for the touchdown. #Packers trail, 7-0. Matt Ryan, 6 of 8 for 64 yards and a TD on that drive, 137.5 rating. #MattyIce ❄️ ➡️ Mo Sanu ???????????? #Packers D forced three third-down situations on that drive. Gave up two first downs and a TD, all on passes. Gotta get off the field. S Kentrell Brice is back in the game on kickoff return. #Falcons QB Matt Ryan on TD drive: 6 of 8, 64 yards, TD (137.5 rating). Three third-down completions including 3rd-and-11 and TD to Sanu. #Packers offense takes the field for the first time. Jordy Nelson, Davante Adams and Randall Cobb are the wide receivers. #Packers WRs Jordy Nelson and Davante Adams on the field to start. Aaron Rodgers' first pass today goes to #Packers WR Jordy Nelson for 27 yards ... wide open. Good sign. Two catches, 42 yards already for #Packers WR Jordy Nelson. What broken ribs?
. 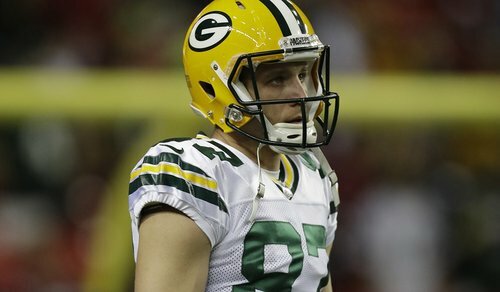 @JordyRNelson 's first catch of the game goes for 27 yards! Falcons LB Deion Jones comes through the line unblocked, and that's what it'll come down to today. Which D makes plays on third down. Crosby misses a 41-yd FG. #Packers fail to convert on third down when Deion Jones blitzes up the middle to force an incompletion. Crosby misses a 41-yard kick. Big.